Classy McGraceful - Feeling Feelings: The Importance of...well...Being Busy? I need to rest and recharge (and work on hats!) for the moment, so no comic this week. 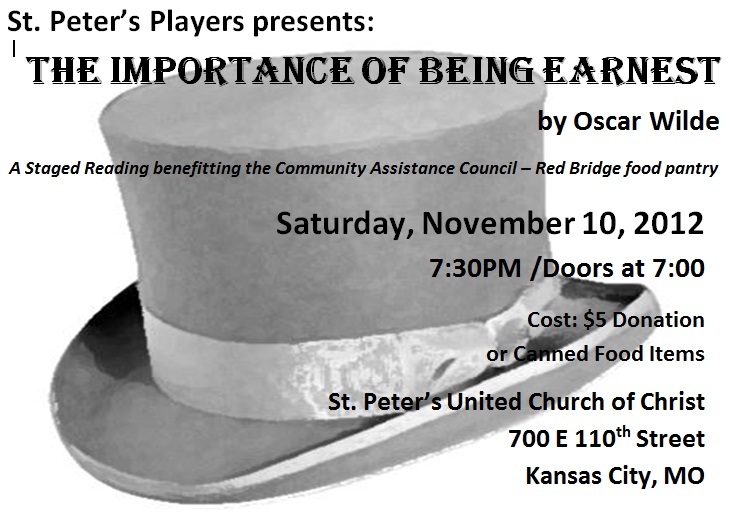 I ALSO am involved in a staged reading this weekend, the very same one mentioned on this hat above! Take note! So, I will use this hiatus to leave you a post with some of my favorite quotes from The Importance of Being Earnest, by Oscar Wilde. Algernon: Oh! it is absurd to have a hard-and-fast rule about what one should read and what one shouldn't. More than half of modern culture depends on what one shouldn't read. Jack: ...That, my dear Algy, is the whole truth pure and simple. Algernon: The truth is rarely pure and never simple. Modern life would be very tedious if it were either, and modern literature a complete impossibility! Algernon: ...Relations are simply a tedious pack of people, who haven't got the remotest knowledge of how to live, nor the smallest instinct about when to die. Miss Prism: The good ended happily, and the bad unhappily. That is what Fiction means. Chasuble: ...What seem to us bitter trials at the moment are often blessings in disguise. Miss Prism: This seems to me a blessing of an extremely obvious kind. Algernon: When I am in trouble, eating is the only thing that consoles me...At the present moment I am eating muffins because I am unhappy. Besides, I am particularly fond of muffins. Algernon: You can't possibly ask me to go without having some dinner. It's absurd. I never go without my dinner. No one ever does, except vegetarians and people like that. Gwendolyn: The fact that they did not follow us at once into the house, as any one else would have done, seems to show me they have some sense of shame left. Cecily: They have been eating muffins. That looks like repentance.